Rather than pay a lot on an expensive accessory to modify your close-up lighting, how about going with a cheap diffuser for your macro photography? I've got 12 cheap DIY ways for you to get beautiful diffused lighting for your macro photography. I've used quite a few different macro lighting diffusion techniques and any of them can work great for you too . Several of the diffusion materials some photographers use are complicated, expensive, and simply not necessary. Don't get me wrong. 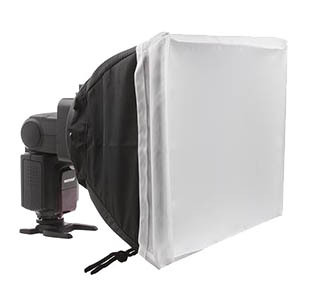 I've purchased and used several different kinds of both natural light and flashgun diffusers and they can be very convenient as well as useful for giving you that appealing soft natural looking macro photography lighting. We're just going to concentrate on do-it-yourself cheap ways to diffuse the lighting you already have. You can do that in two different ways. 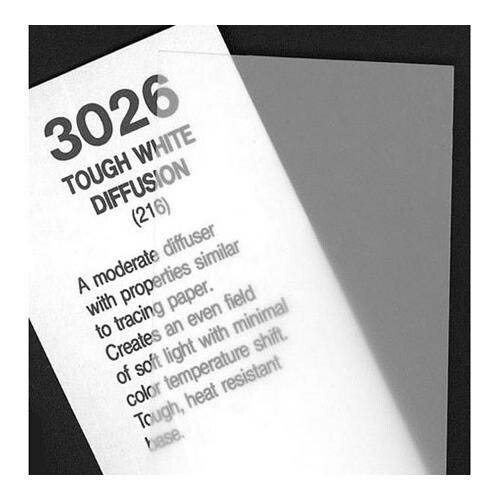 Here is a list of materials you can use to diffuse your close-up lighting. You can diffuse the light by having it pass through something that will scatter the light in a variety of directions. The good news is that you can use a wide variety of materials to accomplish this..
You can also get diffused light by having the light source bounce or reflect off of a nearby surface. What great about using this technique with macro photography is that the reflecting surface doesn't have to be very big, provided it's relatively close to your macro subject. When you are working your digital photography magic in the close-up world you just don't need big and expensive accessories to adjust and perfect the light. 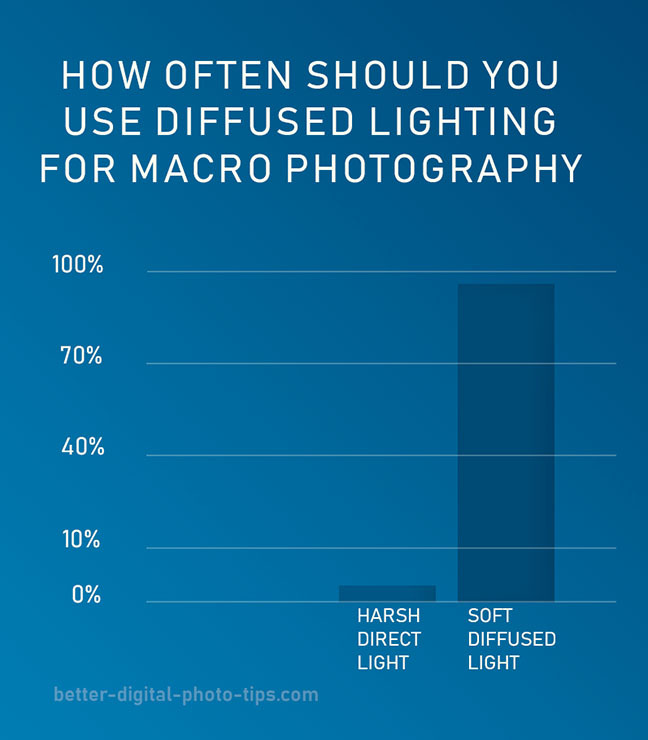 I recently came across an ad for some diffusing material and thought it would be good to share my thoughts about diffusing light when you're shooting macro photos. I do confess that there have been times when I've used electronic flash to light some of my macro photos, but usually it's been in a situation where the level of light is really low, as in nighttime and indoor photography. 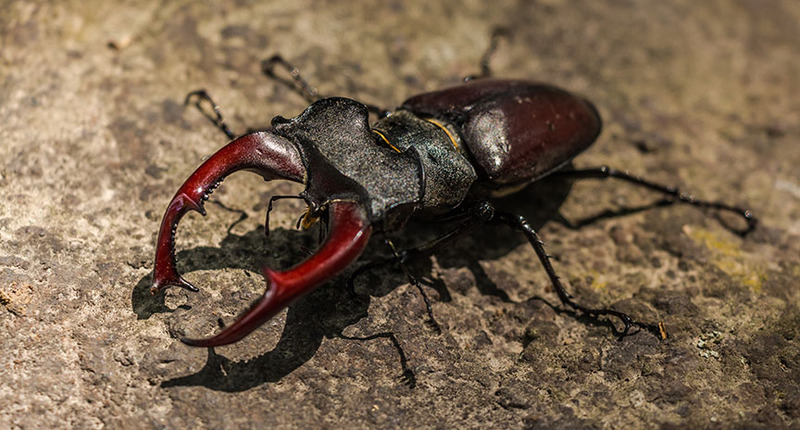 Diffusing light when using a flash unit is very popular for photographing insects. Whether it's outdoor or indoor macro photography lighting can make or break your photo. When Mr. Sunshine is blasting his harsh rays on your subject it's often a good idea to scatter and diffuse the light to make your subject more appealing. When you need to soften the light and reduce the harshness of the shadows you can use a sheet of diffusing material in between your subject and the sun. The light from your flash is very harsh. You may need to use your flash for dark situations and for freezing any subject movement. Using direct flash on a close-up subject will give you harsh shadows and annoying bright highlights. 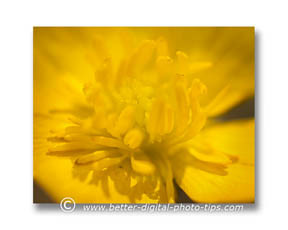 Diffusing light for shooting macro photos can be done in several different ways. We're going to dive into that in a minute, but first let's check out why the type of lighting you decide to use really matters. In this photo of these ladybugs, the light is directly overhead, but has been diffused. You can see the highlights on the insects' shells but the highlights are softened and not distracting. The shadowed area underneath the bugs has non-distinct edges. Compare the lighting on the close-up photo of the ladybugs with the lighting used in the photo below of the arthropod. The highlights on the shell are a little bit distracting and the edges on the shadows is very distinct and contrasty. Contrasty lighting is not automatically bad with macro photography, but diffused lighting usually brings out the details in macro photography and is often more appealing to the eye. The light from the sun with no clouds in the sky will give you sharp shadows. Sometimes it can be good, but usually the shadows detract from the subject. Direct light that isn't diffused can also give you pure white spots from shiny reflective areas of your subject. It's really quite easy to make your own diffuser, either by buying some diffusion material or by using something you already have lying around in your home. Diffusion materials come in a wide variety and you really don't need much to make a big enough diffuser for macro photography. You can cut this to any shape you need any tape it to a small picture frame for support. There are a few different directions to go in. Some diffusers are intended to work with light sources such as specific models electronic strobes and some are more generic in nature. If you need the firepower of a flash gun, due to a low lighting situation, you can soften the light from a standard hot shoe flash by purchasing a softbox made specifically for your flashgun. 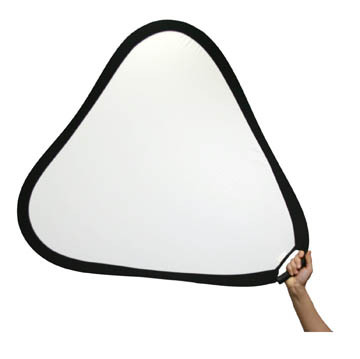 Fold-able diffusion accessories are convenient to carry and usually come in circular, oval, or triangular designs. The photo below is of a diffusion panel that is 32 inches. 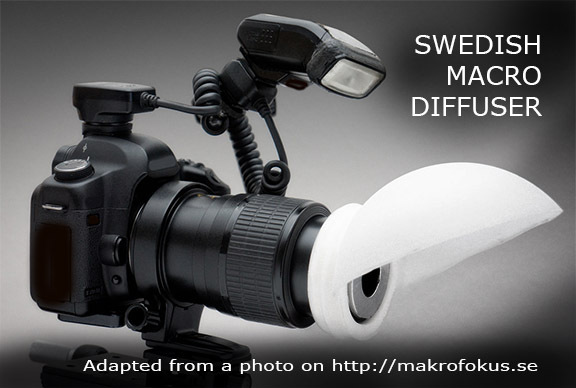 These types of hand-held diffusers aren not really intended for for macro photographers because of their size. There may be some times when you'll want to diffuse the light on the subject as well as on the background and you'll appreciate the large size. I use very large versions of these with outdoor portraits. When I was a newby photographer, some photographers would use a pair of women's stockings as a cheap diffuser for macro photography. Boy, have times changed! There are also macro lighting boxes that you can assemble for inside studio close-up work, These are great for photographing small objects for sale by eBay sellers like jewelry. coins and other small collectibles. Have a blast with your macro photography lighting. Keep it fun!